Home Observations GPS > Cluster ULR "Ymir"
The ULR cluster (named Ymir) is a scale full parallel cluster of high performance (6Tflops): SGI Altix ICE 8200. It is constituted of 392 cores on 38 nodes and 784Go of memory. It is based on the "Lustre" file system technology, which is a distributed file system particularly efficient for the data access from all the nodes. Ymir has an evolutive architecture. 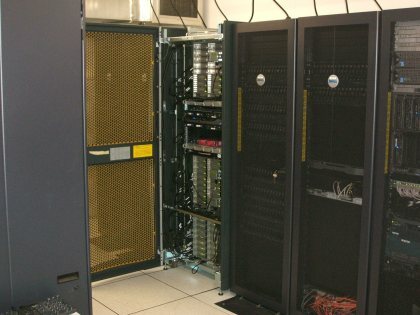 It was bought in 2008 with 16 nodes of two Quad-Core Xeon 5472 @ 3GHz processors (8 cores by node). 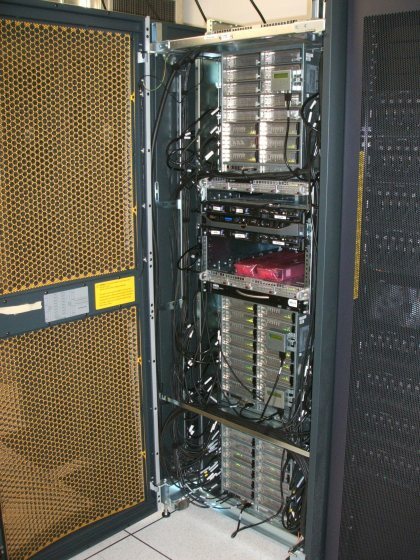 At the early 2010, it was extended with 2 Hexa-Core Xeon 5670 @ 2.93GHz processors (12 cores by node). 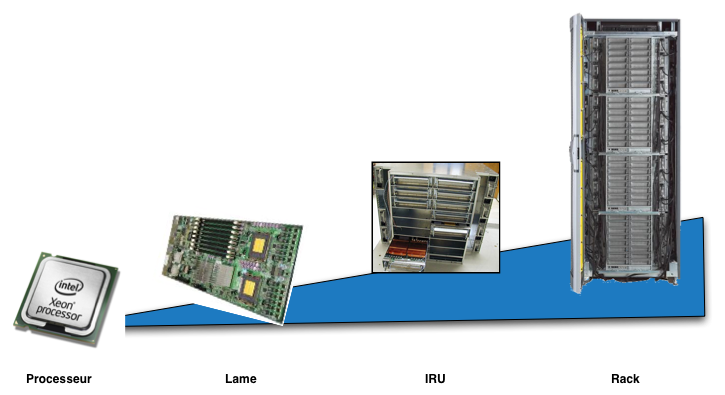 The following picture illustrate the different parts of the cluster. The benefit in computing performance is enormous for SONEL activities. To illustrate this benefit, let’s notice that the treatment of 10 years of the GPS measurements of over 220 worldwide stations now takes 2-3 weeks full calculation where it early needed a whole year using 4 servers with 1 Xeon processor each. Now, the core work of the GPS researchers consists of the analysis of the results, which takes a few months to produce a global and consistent GPS velocity field in the best stable and accurate terrestrial reference frame (ITRF).